With a full new remodel in 2015, this quintessential Hawaiian beach cottage and guesthouse, thoughtfully designed in old plantation style, will comfortably host you and your ohana just a 5-minute walk away from Brennecke’s Beach and award-winning Poipu Beach. Once you've settled in, relax with a book on the screened-in lanai while the kids play out in the lush, tropical yard. With two living rooms, each with a flat-screen cable TV, the adults can keep up with their favorite shows while the kids watch a movie, or bring everyone together for family game night. Three beautiful bedrooms sleep ten in two king-size beds, two twin-size beds (can be converted to a king), and two sleeper sofas, one in each living area. For a couple looking for more privacy, the Manako Hale guesthouse is a charming one-bedroom sanctuary next door with its own kitchen, BBQ, and full bath. Plus, you’ll enjoy exclusive ocean views from both the second-floor lanai and your plush king-size bed. 2. 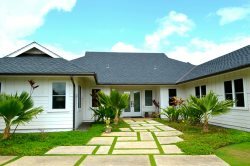 Group Friendly: With a gorgeous remodel and multiple living areas - plus BBQ grills, laundry rooms, and quiet lanais at both the guesthouse and the main house - Manako Hale Estate makes group travel a little breezier. Great place to stay! we had eight people on the trip and the place was perfect for that size. there is a lot of open seating to relax, large enough bedrooms for king size beds in each, and a full kitchen that will allow for you to stay and cook. 5 minute walk from the beach was so help to allow us to not miss a single sunset or a sunrise. I would highly recommend this place to anyone with a large party. This place is a gem for large groups looking for privacy. It was perfect for our group of three families, and the kids appreciated the boogie boards, and toys, and easy walk to the beaches! We adults loved the views and close access to everything Poipu has to offer. Wed definitely return (and stay for years if we could). Visitors should know theres no AC, but the abundant fans and ocean breeze make up for it. Manako Hale is a beautiful property with close walking to beaches for great swimming ans snorkling, as well as walking to get a cup of coffee or good food at Brenneckes at the Beach. We utilized all the spaces to sit and converse, the screened in lanai, the seperate living/tv room, the living room anfd kitchen bar, the deck off the guest house. So many places. The grounds are beautiful and we enjoyed a delicious mango right off the tree. Also, there's a great collection of beach chairs, boogie boards, beach umbrellas and a few beach toys that saved us from needing to rent them and made our beach time more comfortable. I'd stay there again in a heartbeat. I almost didn't leave! Aloha and Mahalo. The main house and guest house are both beautiful, just as advertised! The beds were comfortable, house well stocked, and the atmosphere was comfortable and relaxing. We loved every minute of our stay and would definitely chose to stay here again. Beautiful clean house with lovely yard! Clean, spacious and well appointed house for a family of 5 adults! We had everything we needed, and it was very close to Poipu beach (which was our favorite spot, with great snorkeling!). Excellent location! Clean home with great living space and comfortable beds near the beach. Keyless entry made for smooth check in and check out. Also enjoyed access to the Poipu Health Club w/ yoga classes. Everything was great! The Bungalow could have been supplied with more kitchen tools....plus coffee cups. Also, a few of the beach chairs could be updated. Other than that, everything was top notch! MANAGER RESPONSE: Mahalo for your review! We have gone through the bungalow and added any needed kitchen items (and more coffee cups:) Thanks for letting us know. Hope to you see you again soon. Glad you enjoyed your stay! The only challenge was figuring out all light and fan switches. Just took some playing around. Great location with a 5 minute walk to the beach for some great snorkeling and not far from shopping and resturants. The property is clean and well equipped, and except for the roosters, the area is nice and quiet. The kitchen area is a little tight but the open concept with living room and dining area make up for it. Just go to Costco in Lahui and stock up. The extra quest house is also a great feature for a group of more than 3 couples. You won't want to leave. Had a great time at the house! The house was very family oriented and was able to relax and walk to the beach. Very quiet and lovely. Only opportunity was the wifi wasn't stable and connection from the bedrooms was poor. The wood floor was dusty but besides that the house had everything! Would highly recommend. The Great Vacation Retreats team was very accommodating! I needed the beach towels after our 10 AM checkout, and since I was a local, they allowed for me to return them at a later time. I would DEFINITELY book with them again. Our overall stay was amazing! My friends would want to rent the property again, and if not, at least book with Great Vacation Retreats. The shower stall in the guest cottage needs a good scrub or bleach down. We could use a bigger beach umbrella and a few more beach chairs. Excellent accommodation with all the amenities, we feel like we are at home. Will definitely come back. The home is beautiful and in a great location! We rented both the main and the guest house for our stay, which was perfect for our large party (2 couples, 2 teens, 2 small children and 1 grandma). The homes had everything we needed for our stay: fully equipped kitchens, all linens (including beach towels), even the laundry soap was provided! Heads up to future guests: there is quite a collection of beach equipment (boogie boards, sand toys, beach chairs etc) in the storage space under the guest house! I cannot thank you enough for all personal care and customization of our stay. We appreciate the excellent service and have already started telling others of your great quality rentals. Also, thank you so much for sending the shades we forgot, thank you so much!! Our expectations were beyond what we thought. The house was absolutely gorgeous and so close to the beach. We couldn't be more pleased and look forward to going back!! This property is absolutely beautiful! Both houses were spotless, updated, comfortable, and beautifully furnished. Just as gorgeous as the pictures! Ocean view from both houses. The bathrooms were luxurious - and they even had towel turtles made up for us in each bathroom! Felt like we were at a resort. No A/C, but with the windows open and all fans on (they also provided floor fans in addition to the ceiling fans) we stayed quite comfy. The guest house got a little toasty during the day since it's on the second story but the main house stayed comfortable all day and night. Both kitchens were well stocked, clean with stainless steel appliances and granite countertops. On Alm the paperwork it will suggest a place to rent beach gear - we realized on our very last day that there was actually gear (chairs, boogie boards, etc) underneath the guest house that we could've been using all along. Several beautiful beaches within walking distance (about a five minute walk) - brennecke beach has big waves, Poipu beach has a very calm "baby pool" area as well as good snorkeling... and amazing wildlife! We saw multiple sea turtles sunning themselves on the sand as well as several monk seals resting on the beach! Wow! If you just continue walking down the coast you come upon beach after beautiful beach, each with their own unique characteristics. We did often drive the two minutes to the beach because parking is plentiful and who wants to carry all their beach gear farther than they have to? Sunset is beautiful from the beach. The area is definitely a resort area, which meant we got to enjoy a drink at a beachfront bar as well as some more upscale dining. If you drive into town, there are numerous delicious non-resort restaurants. We felt Poipu was a great location - only an hour and a half to the north shore and about 30-40 minutes to the start of Waimea Canyon (a must! ), as well as 20-30 minutes from the airport and Lihue. We highly recommend this property! Very pleasant stayed at this property. The house and the guest house was very welcoming and comfortable and were able to accommodated all 8 of us. Our stay here in Kauai was beautiful. The pictures were very accurate and the living spaces were quite large. Great location and easily accessible to the rest of the island. Thank you very much for wonderful service. All in all stay was perfect.